The German engineering company Geltz Umwelt-Technologie has successfully developed an advanced recycling plant for obsolete or ageing solar panels. As sales of solar power increase, there is a looming problem that is quite often overlooked: disposing waste from outdated or destroyed solar panels. A surge in solar panel disposal is expected to take place in the early 2030s, given the design life of solar energy systems installed around the millennium. To address this problem before this big disposal wave, the EU has funded the ELSi project. With strong competencies in plant manufacturing and wastewater treatment including recycling, the Geltz Umwelt-Technologie firm has built a test and treatment facility at a large disposal firm to retrieve reusable materials from solar modules. So far, waste management has been limited to the recycling of the aluminium frames and cover glasses of the modules. “Solar module layers are bonded together with polymers that make mechanical separation and treatment of solar module components almost impossible,” explains management assistant Fabian Geltz. Exploring ways to ensure that valuable components do not end up in landfills was at the heart of ELSi’s mission. “Up until now, there has not been any technical solution to recycle and separate the valuable materials from the mixed scrap. The critical step in the recycling process is therefore the destruction of the polymer layers,” Geltz adds. ELSi came up with a novel solution to address this key issue. Using an energy-efficient pyrolysis process, project partners managed to dissolve the undesired polymer layers and easily detach the glass in the panels. This novel advanced process enabled them to successfully separate and recover aluminium, glass, silver, copper, tin and silicon in their pure form. “Thanks to the successful recovery of materials and components, the unusable solar module can become a valuable source of raw materials for the future,” notes Geltz. During the process of isolating and classifying materials, the fine materials were separated by sieves and air classifiers. 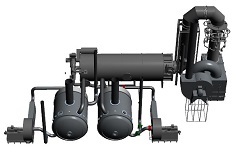 To treat the exhaust gases of the mechanical process, project partners used a thermal afterburner and a quench system with a gas scrubber. After extensive test operations aimed at optimising the process parameters, the new industrial pilot facility could process up to 50 000 solar modules per year. On analysis, project partners concluded that they successfully met their design objectives. In other words, one cycle of the pyrolysis process should treat about one metric tonne of solar module waste. The project’s recovery methods should yield over 95 % of recycled material. ELSi’s novel recycling technologies are expected to improve the economic viability of industries involved in the recycling and the consumption of raw materials. In turn, this should strengthen Europe’s position in the global market for recycling.